Save Money and the Environment: A single plumber visit can cost hundreds. Drain snakes and liquid drain cleaners are a hassle to use and aren't always effective-not to mention the toll they take on the environment and on your pipes. 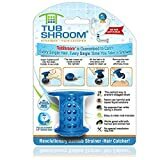 Money-back Guarantee: We're so sure that you'll love your new clog-free life with TubShroom, that we're giving you 60 days to return it if you're not completely satisfied. Over 12,000+ raving Amazon customer reviews can't be wrong.